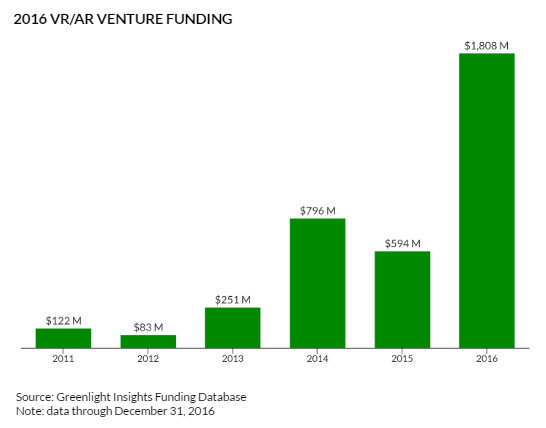 The first half of 2017 has seen increased venture capital activity for VR and AR startups. This report quantifies several important investment trends. Although the 2017 aggregate funding of VR/AR startups is unlikely to surpass the 2016 record tally, VC investing trends remain strong. During the first six months of 2017, there have been more than 100 deals, with more than 30 raising $2M+. Instead of investing in HMDs and content, investors are increasing focused on deep, long-term technologies, like volumetric and lightfield capture technology. M&A deal activity has increased significantly, indicating future consolidation of VR/AR companies. The dataset is available to subscribers.